Zarathustra had a religious vision in which he received the basic tenets of his creed. He then set out to preach the word, but was forced to flee his homeland because of his unorthodox views. He made his most important convert in 588BCE in the person of King Vishtaspa, ruler of a minor kingdom in eastern Iran. Thereafter he was able to count on state support in spreading his message. He is said to have died at the age of seventy-seven in 551BCE. Most of what is known of Zarathustra’s beliefs comes from the Avesta, the Zoroastrians’ holy book. The sacred texts, however, were not written down until the time of the Sassanian Empire, the better part of a millennium after the prophet’s death, and only one section of the work, the Gathas (“hymns”), is generally attributed to Zarathustra himself. Working within the context of existing Persian beliefs, Zarathustra promoted a complete religious revolution. Where there had previously been many gods, he introduced monotheism. Although he continued to acknowledge the existence of lesser spirits, these now answered to a single controlling deity, Ahura Mazda (“Wise Lord”), who alone was worthy of worship. The master of creation, driving force of nature, originator of the moral order and supreme judge, Ahura Mazda was in effect omnipotent, although he could count for help in exercising his power on a Holy Spirit (Spenta Minyu) aided by six beneficent entities known as the Amesha Spentas (“Bountrous Immortals”). These seven beings are thought by some religious authorities to have inspired the seven archangels before God’s throne in the biblical Book of Revelations. The universe that Ahura Mazda created was one of free choice, a fact that introduced a fundamental dualism into the world. Opposing the forces of truth that he represented was a figure of evil, Ahriman. He too had his band of supporters, the daevas, who in the Zoroastrian schema were fallen gods who had chosen wickedness and become demons. Although created by Ahura Mazda, Ahriman had deliberately selected the path of evil over good. Humans too had to make a choice: to follow the path of righteousness, which led to an eternal life of happiness and light, or to embrace falsehood and deceit and so condemn themselves, when their souls came before Ahura Mazda for judgment after death, to eternal darkness and horror. If Ahriman was a precursor of the Judeo-Christian concept of Satan, Zarathustra’s ideas similarly heralded later notions of the Last Judgment. In his vision there was to be an endtime, “the last turn of creation,” in which Ahriman and all his works would be finally destroyed and the forces of light would triumph in a transfigured world. One conduit by which such ideas influenced Jewish tradition may have been the Old Testament prophet Daniel, who served as a high official at the Persian court under Darius and Xerxes. In matters of ritual, Zarathustra retained the bull sacrifice of pre-Zoroastrian time while modifying the method of killing to reduce the animal’s suffering. He also moderated the use of haoma, the sacred liquor, in religious rites to discourage abuses. However, he reemphasized the importance of the fire ceremony, which became the central act of worship in his reformed faith. The sacred flame that burned in Zoroastrian fire temples was a symbol of purity, and to defile it was death; priests wore mouth masks to avoid contaminating it with their breath. It remains unclear how widely Zarathustra’s ideas spread in Achaemenid times. There is no mention of his name in contemporary inscriptions, nor of the Amesha Spentas, who were central to his beliefs. 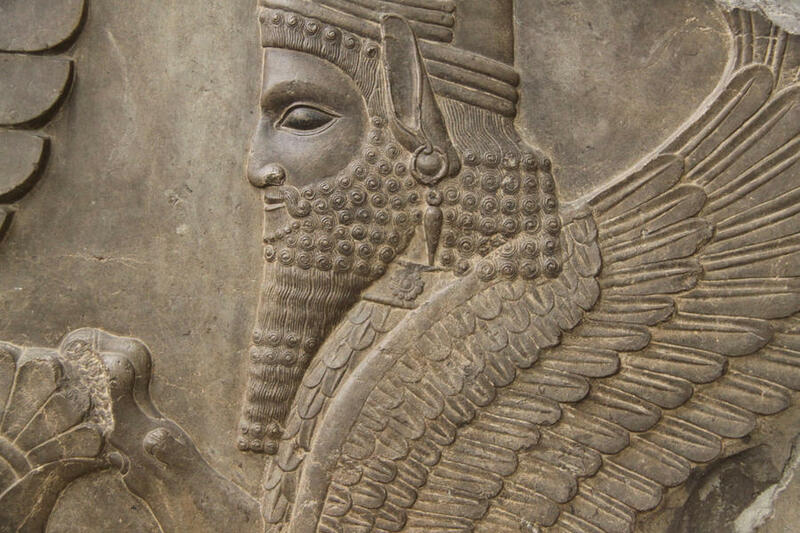 Yet reliefs from Darius’s day show the ruler worshipping at a fire altar with a winged disc representing Ahura Mazda floating over his head. The remains of a fire tower can also still be seen in front of Darius’s tomb at Naqsh-I Rustam. Under the later Achaemenids the strict monotheism of Zarathustra’s vision seems to have been compromised, perhaps under the influence of the Magian priesthood. An inscription from Artaxerxes II’s reign mentions two other gods besides Ahura Mazda: Mithra and Anahita, a fertility goddess linked with Ishtar. 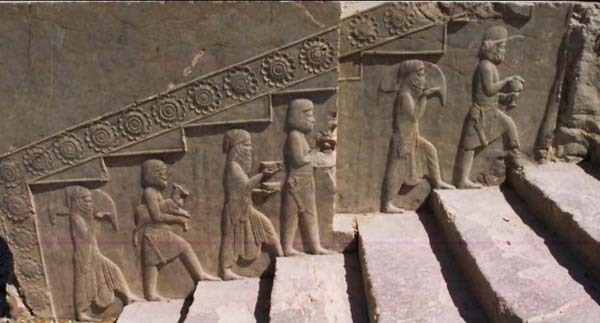 Under Greek rule Zoroastrianism went out of favor, but it re-emerged as Persia’s state religion under the Sassanian dynasty, which ruled the nation from 224CE. The triumph of Islam in the mid-seventh century largely supplanted it, and its followers became a persecuted sect. Even so, pockets of Zoroastrianism survive in Iran to this day, and the Parsi (“Persian”) community in India continues to keep the faith alive. I find this very interesting, having read the works of Zecharia Sitchin and believing that the Anunnaki still had a string influence over man during these times. If only more evidence could come to light from these times to allow us to either prove current beliefs or to improve on them. Beautifully researched and written. Voted and appreciated. Excellent write as always friend, thanks. Very fascinating historical facts about a great nation. Another mystery read from you. Interesting post as usual. Great article! It's very interesting that their belief in dualism and free will are like modern Christianity. There is a very large Zoroastrian following in the US today.